At the INCA (Insulated Render and Cladding Association) Awards event held 20th October 2016 in London, Hop House won two awards for Domestic Refurbishment High Rise and Architectural Design - another great achievement for all involved. A variety of Sto products were used on the exterior of the Dukelease Properties Hop House building in London's Covent Garden, which has already won the ‘Conversion, Restoration or Refurbishment’ category of the 2015 Sunday Times British Homes Awards. The project saw the 5-storey, 1980s office building converted into 29 luxury apartments, with a new two-storey penthouse roof extension added. The project architects - Brimelow McSweeney Architects – remodeled the exterior façade to enhance its original Viennese-style design, and this included re-defining the original cast stonework on the front elevation. “We chose StoDeco Plan boards for the front façade, to create new window relief and entrance detailing, and to enhance some of the concrete sills, stone plinthwork and other original features that were retained.” explains Sheila Eilenberg. of Brimelow McSweeney Architects. 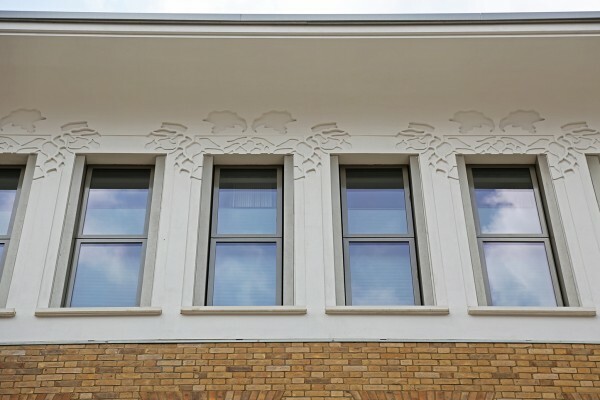 Another key element of this project was the creation of a striking curved frieze to the top floor, below the large overhanging eaves,” explains Mark Shepherd from Sto Technical Services. “This was an absolutely bespoke solution and had to include some sharp and clearly defined relief work, which was designed around the growing and harvesting of hops - an activity whose links to the local area stretch back to the 17th century. Creating the desired effect on the frieze demanded close collaboration between the architect, the client and with Dartford-based render and exterior specialists Regency Plastering. “We worked very closely with Sto’s technical and manufacturing teams and their expertise proved to be invaluable in designing the most effective solution.” adds Regency’s Paul Brown. For the frieze, a series of formers were constructed over the original stonework to support the StoDeco Plan boards. These lightweight boards combine excellent weather resistance and rugged mechanical properties so they were the perfect choice for this project. The boards were laminated, and then elements of the bespoke 3-dimensional hop design were machined using Sto’s state-of-the-art CNC milling machines. The boards were also carefully pre-kerfed on the reverse side so that they would conform to the required curve and also accommodate any dimensional discrepancies when applied to the building. StoTherm Classic K external wall insulation (EWI) system was also applied to the rear façade of Hop House to achieve the target U-value of 0.20W/m²K. This system incorporates EPS board and cement-free components to provide market-leading thermal performance and impact resistance. Adhesive application allows for quick and simple installation. A top coat of StoSilco silicone render finish was also applied. With a high level of water repellence, this render provides excellent protection against weathering and dampness, and is also resistant to algae and fungal growth.